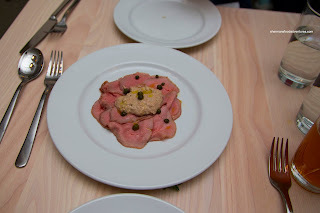 I've been a fan of Chef Lucais Syme ever since I first set food at La Quercia. So much so, I made several return visits (which I rarely do). 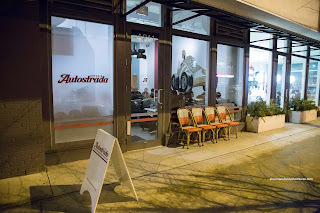 Then I had subsequent great meals at Cinara and La Pentola. So when I heard that he was opening a new restaurant on Main Street (aka Hipster Central), I was quite anxious to try it out. So I waited and waited some more shadowing their Facebook page every week in December. Finally, they opened on January 10th. Choobee and I met up check the place out a week later. We were seated in the middle of the restaurant and let's just describe the place as cozy. 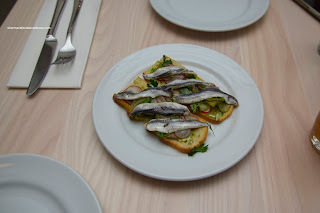 We started with a couple of appies including the familiar Anchovy on Toast (from Cinara). This featured white anchovy, radish, pickled cucumber and herb butter on somewhat toasted bread. I say that because when I picked it up, half of it almost fell limp. Despite that, I still enjoyed it due to the impactful saltiness (but just enough) married with the considerable tang from the pickles. Also loved the crunch that kept things from being one texture. Next up, we had the Vittolo Tonnato (also from Cinara) with the usual shaved veal, tuna sauce and capers. This was very good where the thin veal was the right doneness being super tender and almost buttery. The tuna mayo on top was texturally on point being creamy yet with still the meatiness of tuna. It was amped up with saltiness from the capers. 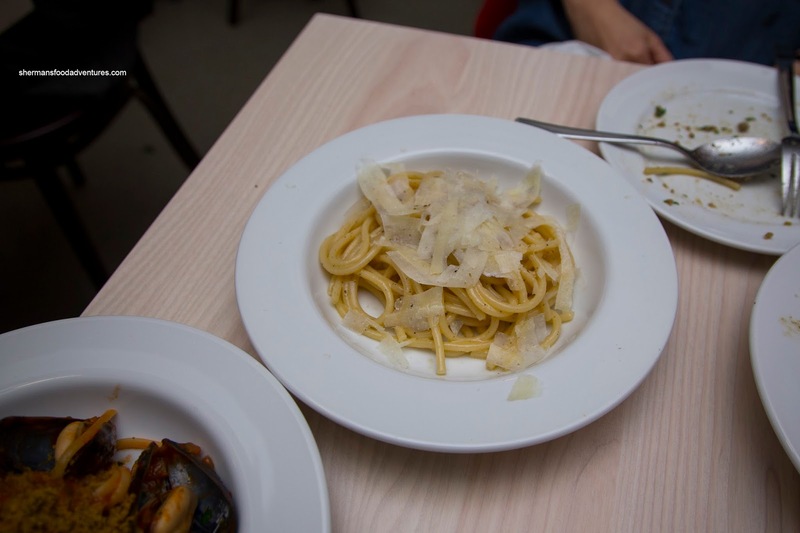 Onto the pastas, the Spaghetti with duck & anchovy ragu arrived first. It featured firmly al dente pasta that had a great mouth-feel. It was also nicely salted. There was a generous amount of tender duck that was rather mild-tasting as we were expecting more anchovy impact. However, the dish was still tasty being hearty and cheesy from the pecorino. When the Linguine with clams and mussels hit the table, we attempted to find the clams to no avail. Did they forget or was there no clams for the night? That in itself impacted the level of brininess. 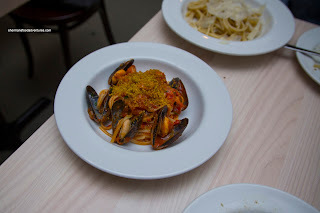 There was some due to the buttery and plump mussels, but without the clams, the sauce was merely tangy and spicy. We loved the flavours as they were definitely there, but it was definitely missing the clams. Lastly, we had the Bucatini with black pepper, butter and pecorino. Yes, this was a very simple pasta, but also my favourite. The bucatini (in place of the lumache) was a perfect al dente and was nicely salted like the previous pastas. 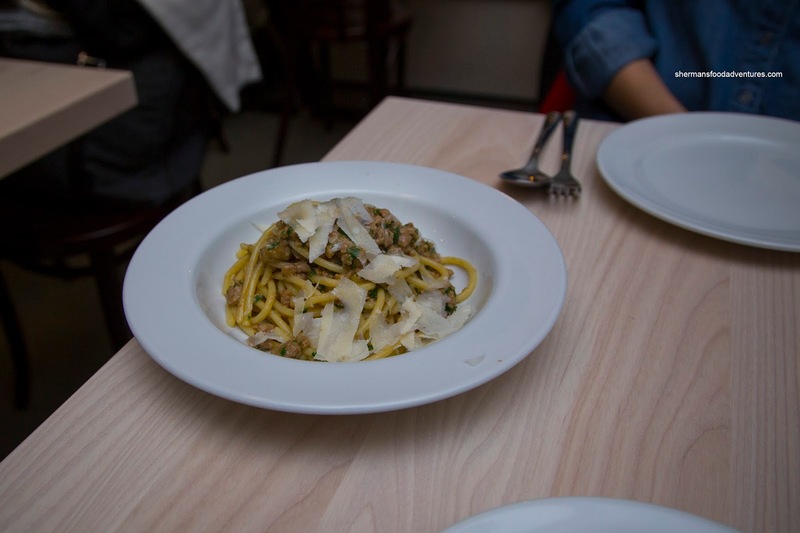 A bit nutty and slightly peppery, the pasta ate well and wasn't overly greasy. We could've used a bit more black pepper though. In fact, we could've used more food in general as the portions (like Cinara) were on the smaller side. Yes, the ol' adage of quality over quantity does apply here, but when you spend $100.00 for 2 people before tip, you want to walk away full too.